A series of articles published in Animator’s Newsletter form a comprehensive guide to the history of British animation. Film students and historians will find it a useful introduction to the subject. Steve of the River produced by Roland Davies in 1936. In part one The Shadows Move – the British pioneers, animation historian Ken Clark looks back to the birth of the animation industry. Early cartoons such as Bert Acre’s “Tom Merry” film were little more than a filmic adaptation of what was then a popular music-hall act, a lightning artist speeded-up in miraculous manner. Stop motion filming was pioneered by Arthur Melbourne-Cooper who used it to animate matches and children’s toys. Former conjuror, Walter Booth, made “The Hand of the Artist” in 1906. The hand is seen sketching a costar and his girl, they come to life and dance together. It had been discovered that the earliest film emulsions were insensitive to the colour blue. The first drawing in the sequence was completed using a blue pencil, then, under the camera, the artist inked over the original an eighth of an inch per frame. The hand was withdrawn momentarily obscuring the character. Thereafter it ‘came to life’ by means of the separate-drawing system. In part two, The 1930s, we find that in 1935, Anson Dyer and Archibald Nettlefold opened Anglia Films Ltd., Dyer filled the art rooms with the best talent he could find, headed by two Danes: Mykleson and Myller. Len Kirley, Laurie Price, Sid Griffiths, Spud Murphy, Lesley Manners, and Charles Stobbart the cameraman were key personnel. Charles was a cousin of the famed screen actor Charles Laughton. It was Jorgan Myller who designed the first in a series of Operatic Burlesques entitled “Carmen”. The film had a certain panache, style and pace, and involved full animation much to the dismay of Dyer who was visibly taken aback by the enormous stack of animated drawings. This production could have set the pattern for a very successful English series. Perhaps it was not as slick or as advanced as the Disney films of the day, but time would have ironed out the wrinkles and sharpened the wit in future productions. It is idle to speculate the possibilities, because Dyer decided upon a change of plan half-way through its production. Part three The 1940s informs us that in May 1940 J. Walter Thompsons took under its wing a new animation unit when John Halas and Joy Batchelor opened their now famous Halas and Batchelor Animation Studios. Alexander McKendrick, who had not yet broken into live feature film production, scripted their first film, an advertising short for Kellogg’s Cornflakes: “Train Trouble”. This was followed by “Carnival in the Clothes Cupboard”, advertising LUX toilet soap for Unilever. Thereafter the small studio made over seventy shorts for the War Office, the Ministries of Information and of Defence, Central Office of Information, and the Admiralty. G.B. Animation is the subject of part four. 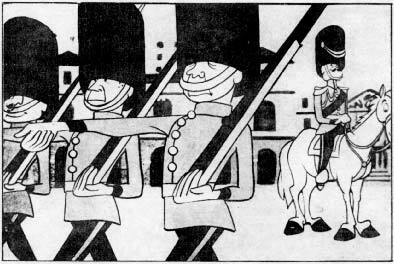 We learn that in 1944, the Rank Group set up a small cartoon unit, just six people and a tea-boy. This little group joined forces with G.B. Instructional Films, and became the nucleus of a much grander organisation: G.B. Animation. The intention was to build a company to rival Disney, and was expected to be fully operational within three years, at an overall cost of an estimated £2,500,000. It was hoped that the 500-odd vacant positions would, in the main, be filled by returning ex-servicemen and women, although a nation-wide talent search prompted applications from children of nine and ten; exterior decorators who fancied a change of scene; a typewriter salesman; a former poster and magazine artist, and many others from all walks of life. Moving on to The 1950s, Ken mentions the many small studios who survived the war and continued to produce films well into the peace that followed: Diagram Films, Science Films, Worldwide Films, Basic Films, G.B. Instructional, Publicity Pictures/National Interest, not forgetting Francis Rodker’s work for Shell Film Unit and Bill Palmer’s diagrammatic work for British Transport. These and others like them produced miles of top quality technical, educational and advertising material. The rise of TV animation is the subject of part six. When Commercial television arrived in the UK in 1955 to challenge the cinema and BBC television, animated filmmakers were already aware of the new market for their productions. Two Guardsmen, commercial for Murray mints by Halas and Batchelor. Ken observes that although it took some ten years for television to reach its potential mass market, in that time animation really flourished. Not all of it was memorable. Halas & Batchelor’s famous “Murray mint” commercial was the exception rather than the rule when we speak of quality work. That is not to say other studios were not capable of keeping up a high standard. The problem lay with the demands of the new medium. The TV cartoon figure was born; chunky little figures standing about 2 to 3 heads high. Entertainment series for children employed all the old short-cut methods of limited animation with simple effective draughtsmanship. Ken Clark concludes his history of British animation with a look at The 1970s. British animation continues to win accolades and awards at the international festivals, and it is a recognised fact that our animators are among the best in the world, but we should not forget it was American sponsors who came to England to persuade H & B to make Animal Farm; Americans once again who backed Yellow Submarine; and it was American money that made “Watership Down” a practical proposition in 1978. Thank you for the link cigarman.